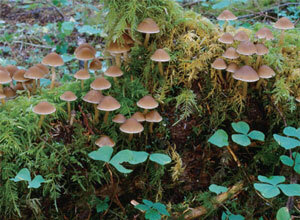 Mushrooms of the Pacific Northwest by Steve Trudell and Joe Ammirati has instant credibility with us; we've met both men, and have very high regard for their expertise in the field. Trudell is affiliate professor in the College of Forest Resources at the University of Washington, and Ammirati is professor of biology and teaches mycology and botany at the same University. 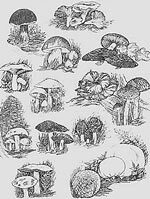 Earlier, Dr. Ammirati revised and enlarged the esteemed The New Savory Wild Mushroom (our much used copy, the third edition, dates to 1987), which remains indispensable to anyone attempting to learn about wild mushrooms in our part of the world. Both Trudell and Ammirati are very fine educators, and know their subject well. Perched on an Astoria pier looking out at the mighty Columbia River near its entrance to the blue (or, more often, gray) Pacific is a unique restaurant, Baked Alaska. The view is lovely, and so is the food. An innovative menu with imaginative pairings will make your choice a complicated and agonizing one. There always has to be a noteworthy mushroom dish to be included here, and this one was a beaut: "Crab and Mushroom Sambuca Carbonara," described as "Crimini and oyster mushrooms sauteed with sweet onions, bacon, garlic, parsley and crab meat, in a light Sambuca reduction sauce over fresh fettuccini." Our mouths began to water as we read it.